Stars will have to win their last league game now to go through to the semis. Brisbane Heat have done no harm to their semi-final qualification hopes with a huge win over the Melbourne Stars in the 53rd match of the Big Bash League (BBL). This victory from the Heat have made things interesting now and has kept the Sydney Thunder also alive in the tournament. Thunder will need a huge victory now over the Hobart Hurricanes on Saturday to better the Heat’s net run-rate. Moreover, whichever team stays alive after the second game on Saturday, will have their eyes glued to the TV sets when the Melbourne Stars will take on Sydney Sixers. The Stars only need to win their last league game to qualify but that has been the case for them in the past two games as well. But they haven’t got things together and are left with a lot to do in the last match. 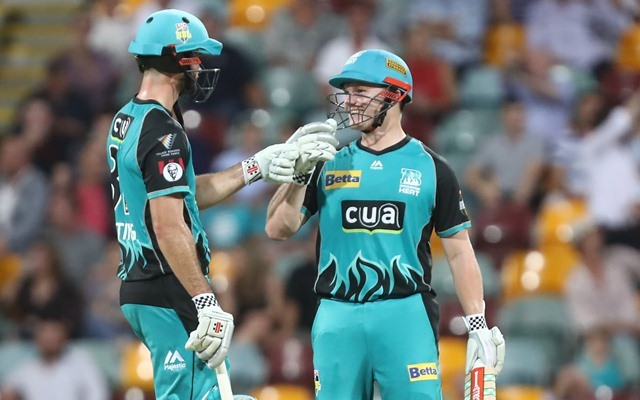 Max Bryant and Ben Cutting opened the innings for the Brisbane Heat in the 157-run chase and literally ripped apart the Stars bowling attack from the word go. The duo smacked the ball to all the parts of the ground and lit up The Gabba with their clean hitting. A total of 13 sixes and 10 fours were hit by them 158 runs were with a massive 10 overs to spare. The Stars bowlers were left shocked and could do nothing but admire the way their opponents batted. It was one of the quickest chases in the history of T20s and it couldn’t have come at a better time for the Heat. Earlier in the day, Brisbane Heat opted to bowl and had to witness another brilliance from Marcus Stoinis. He scored 81 runs off just 51 balls to keep the ball rolling for his team but there was no support from the other end. Only Dwayne Bravo crossed the 20-run mark as the wickets crumbled at regular intervals under pressure. Josh Lalor kept them under the radar by picking three wickets while the other bowlers also chipped in to restrict the Stars to 156 runs for the loss of eight wickets in 20 overs. It looked a competitive total then but little did anyone know that Cutting-Bryant duo will rip them apart in the chase. Let him open in IPL aswell…. Am I watching a live Cricket match or it's some Cricket game. Imagine hitting 71* off 30 and getting overshadowed by your partner. 81* off 30 take a bow Ben Cutting. Brisbane Heat scores 158/0 in 10 overs during their chase vs Melbourne Stars. Their run-rate of 15.8 is the highest in a Twenty20 innings that lasted at least 50 balls.